My California brother Chuck is visiting for the weekend, and it’s his birthday! 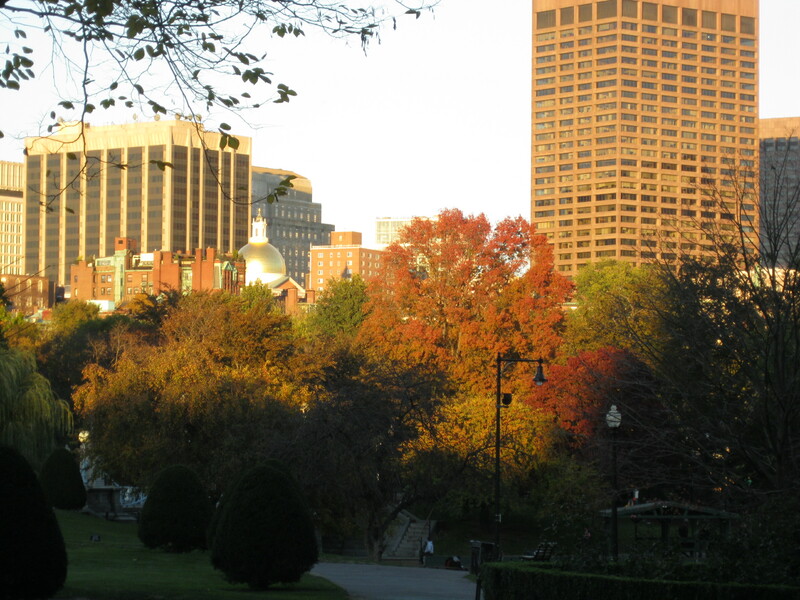 We went to Boston to see the last bits of fall color in the Public Garden and admire the Newbury Street shoppers, outfitted in sumptuous boots and scarves, despite the near 60-degree temperature. In honor of Chuck’s birthday, I combined his favorite foods–roasted vegetables, butternut squash, and goat cheese–into an entree salad. For a Californian who still has access to fresh tomatoes and corn, this salad seems kind of exotic and unusual. It was also inspired by Wednesday’s farmers’ market haul. Much of this salad can be prepared in advance. I made the dressing, and peeled and chopped all the vegetables, except the apple and potatoes, earlier that day, so it came together quickly. Make dressing: Mash the garlic and salt into a paste with a pestle or round side of a citrus reamer. With a fork or small whisk, mix in the rest of the ingredients and add salt and pepper to taste. Refrigerate if not serving within 2 hours. Preheat oven to 375 degrees. Brush 3 rimmed baking sheets each with one tsp olive oil. Place vegetables, grapes, and apples on pans, taking care to make sure that they are not crowded and each piece has some space around it. Keep all the vegetables and fruits of the same kind together because some might need longer cooking times, and this way it will be easier to check and remove the vegetables as they are done cooking. 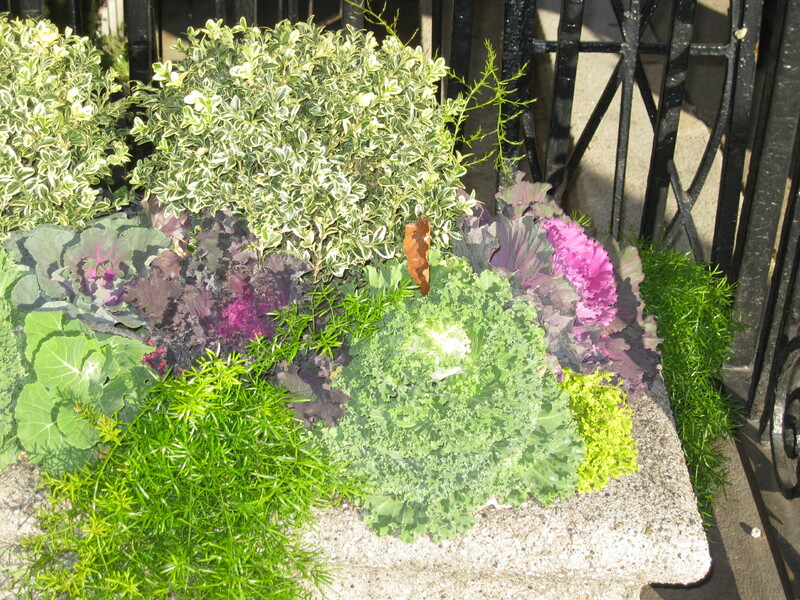 Brush vegetables and fruit lightly to coat with oil, sprinkle with thyme and rosemary, and salt and pepper. Put pans in the oven to roast. 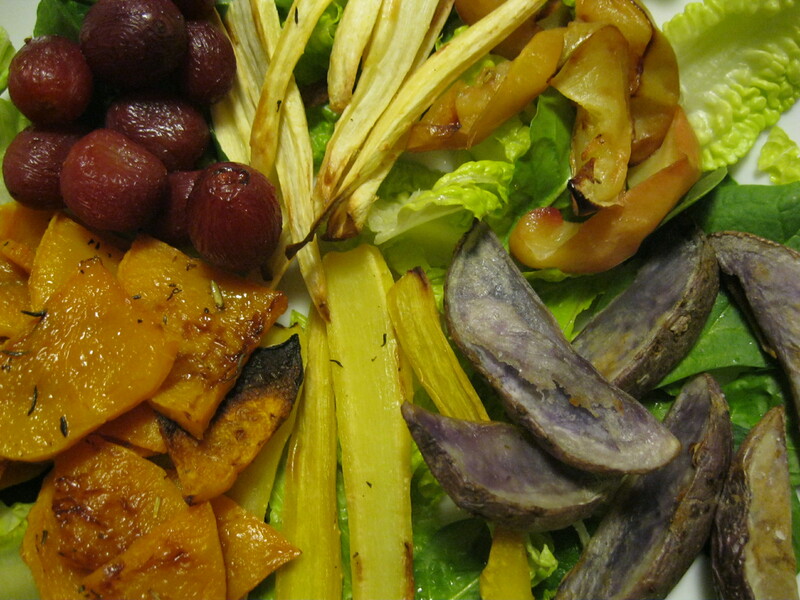 After 10 minutes, turn over the vegetables and fruit, and roast for another 8 minutes. Check and roast until vegetables and fruit can be pierced easily with a knife and are brown around the edges, transferring vegetables and fruit to a platter as they finish cooking. While the vegetables and fruit are cooking, divide the salad greens onto the four plates and then prepare the goat cheese. Mix the pumpkin seeds, oregano, and salt in a small bowl. Cut or scoop the goat cheese into 8 small pieces, roll into balls, and flatten into ½-inch-thick discs. 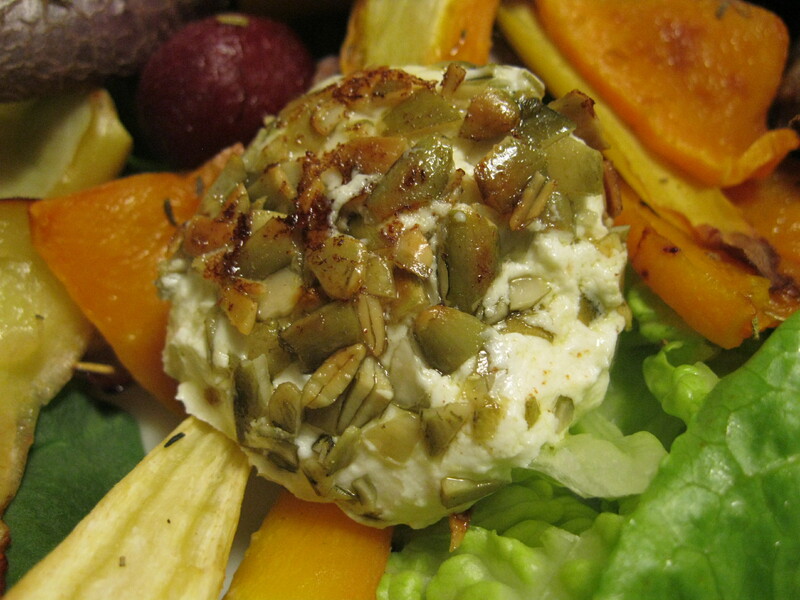 Press the goat cheese discs into the pumpkin seed mixture so they are coated on both sides. Put into the freezer for 5-10 minutes. When the vegetables and fruit are finished roasting, arrange them on the salad plates and then finish making the goat cheese: Heat a small nonstick pan over medium-high heat, add 1 tsp olive oil, and add the goat cheese discs. Cook for about 3 or 4 minutes each side, until the pumpkin seeds are toasted. Scoop two goat cheese discs onto each salad plate, drizzle each plate with dressing and freshly ground pepper, and serve immediately.